I’ve been writing a lot recent about life lessons learned from playing chess as a kid. Here are some life lessons I learned as a result of the fact that my father never let me win a chess game against him. Based on what I have seen adults doing with children, I somewhat suspect this is unusual. I get the impression that parents like to let their children “win” at something, presumably for the purpose of giving them a “self-esteem” boost. I think it’s important to demonstrate compassion and judgment in encouraging children in their pursuits, but based on my own experience, I am not sure it is necessary to let a kid “win” when the win is nowhere near deserved objectively. My father never let me win a chess game against him. 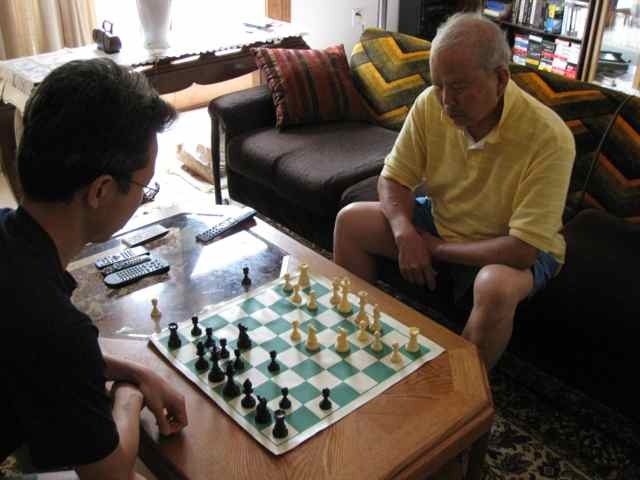 I played many games with him starting from around age 3, and I did not win a single chess game against him until age eleven, on my own merits alone, when I had overtaken him in my strength. I don’t know what his rationale was, but I do know what his behavior taught me. Reason and logic have a force of their own, that lies beyond nepotism and other external factors, and must be respected and cultivated. Sometimes one deserves to lose, based on reality, and a child should learn to be a loser and not let losing be correlated with self-esteem or love. Children at some point can detect lying, and my father showed me respect by not pretending to lose. Children also appreciate compassion, and I knew my father was not always playing at full strength (he magically got better as I got better), but also knew that by not playing at full strength he made the game challenging yet fun for me, rather than demoralizing and impossible to learn level-appropriate lessons from. When I actually finally won, it was a big deal, not something that just randomly happened for no reason; I knew that I had reached a true milestone in my life, in which I had through hard work actually surpassed my father at something. Unfortunately, it turned out that when I won my first game with my father, that was the last game we ever played again for two decades. We never talked about why we stopped playing. After that game, simultaneously neither of us asked again to play the other. There was some kind of unspoken awkwardness. I was heading toward puberty and had begun acting up and resisting authority by that time, and he had been discouraged in his own quest for chess improvement, so he basically quit playing chess after I beat him for the first time. It was an awkward time. We played our first game in decades only when I was into my thirties and I was visiting one Christmas and invited him to play. We played, and I showed no mercy, and I won, but it was an honest game. Like old days. We still play now and then when visiting each other. He knows my level, I know his level, and we know I am basically always going to win, but what can we do other than play some honest games and enjoy the artistry we create together, no matter who wins? Outside of official competitions, winning is not the only thing. It wasn’t when I was a child, and it isn’t now. The renowned chess instructor Bruce Pandolfini gave a nuanced, thoughtful answer to a parent’s question about whether to let a child win. (Update of 2013-12-22: Unfortunately, the link I originally provided to his article no longer works, as Chess Cafe has begun removing archives of its content). I still think that how my father operated worked out well for me. I learned to value getting better, rather than winning. I trusted that getting better would eventually lead to winning, and it did. Even as an adult who has limited time and ambition, I still value getting better over winning. And I just won the 2013 Pittsburgh Chess Club Championship. I am in the top 40 of the active rated chess players in Pennsylvania. I wouldn’t be here if my father had not instilled in me a love of excellence and an honest self-evaluation. I don’t even feel good when I win. I only feel good when I judge that I deserved to win. Hugh Patterson at The Chess Improver posted a great article “Some Thoughts for Parents”. Meanwhile, although I am not a parent yet, I am teaching chess now, so I’m personally facing practical decision-making in how I try to simultaneously install love for chess, sheer fun, and a healthy drive for excellence. Two years later, I made a focused push, temporarily putting many things aside in my life, in the fall of 2015 to achieve my US Chess National Master title, and finally made it, a dream come true. But it wasn’t winning that matters to me in this achievement: it is that I have actually been playing pretty well and feel I finally deserved the title. When I was not playing well, I did not feel I deserved.